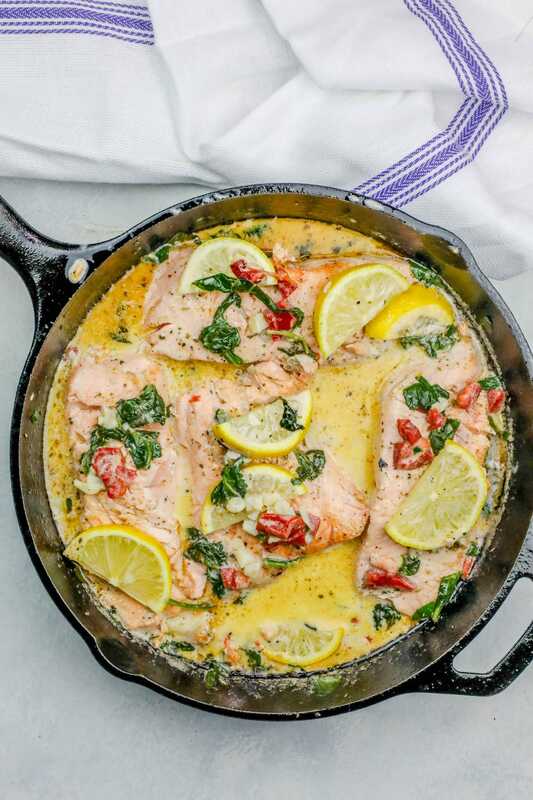 One Pot Creamy Lemon Salmon Florentine Skillet With Spinach Cream Sauce is a simple, delicious meal your whole family will love! 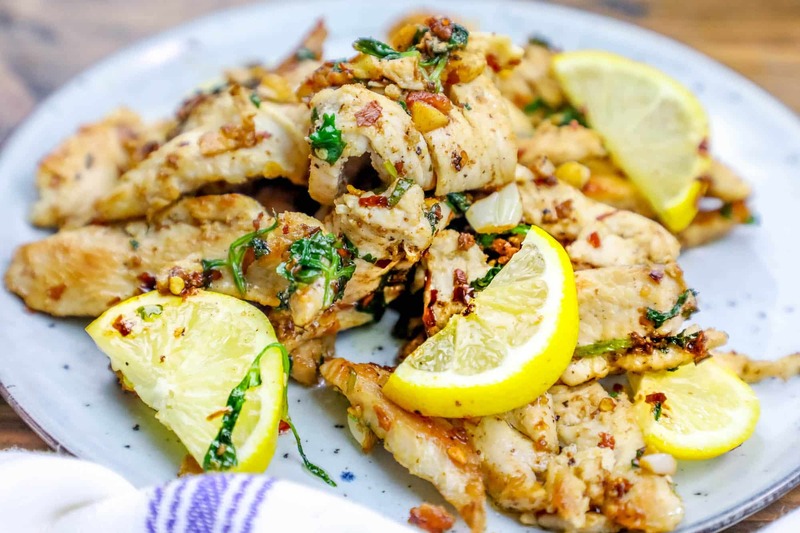 I love delicious, easy, and totally creamy meals that are packed with flavors like roasted garlic, lemon, and butter. 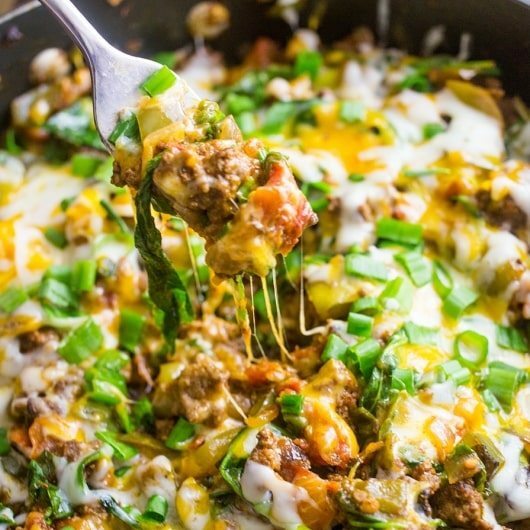 My husband and I have been on a major creamy-anything kick lately – and have been losing weight following a really low carb diet – even though we’ve been eating really rich, delicious and comforting food! This creamy lemon garlic salmon florentine is a huge hit – its great on it’s own, but also makes a killer pasta or creamy rice dish. It’s packed with flavor, and so easy to make in under a half an hour! 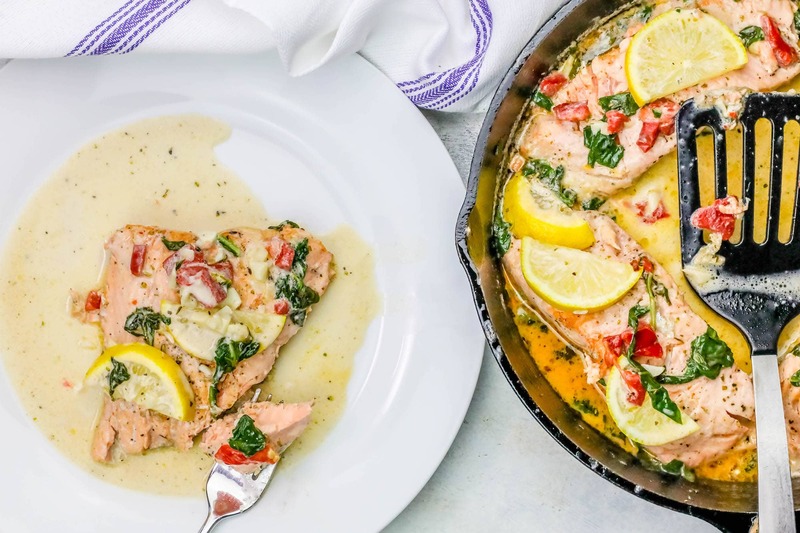 While I’m calling this dish a florentine, it could also definitely be considered a creamy garlic tuscan dinner – with rich tuscan flavors of lemon and garlic, this creamy tuscan garlic salmon is a one pot dish everyone loves! To help keep your sauce from breaking, you need to use full-fat butter (no clarified butter, olive oil, or ghee) AND you need to reduce your heat to low or turn it off completely while slowly adding cream, and whisk vigorously. 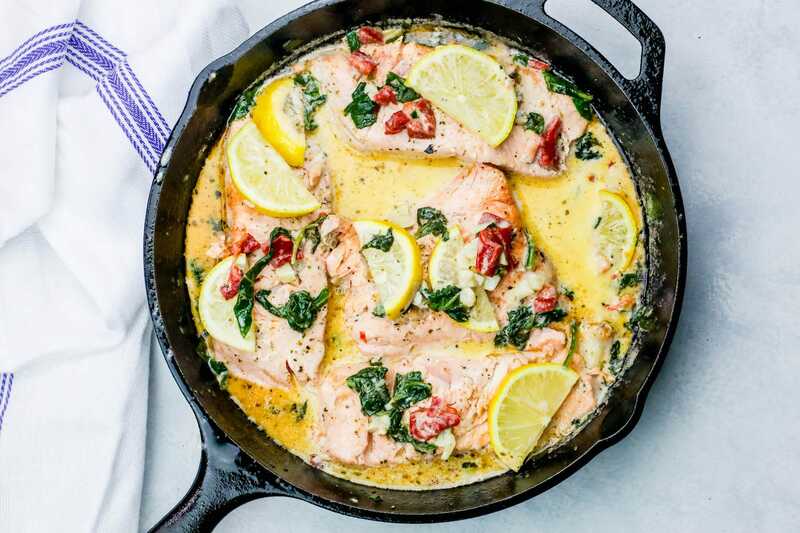 Use a nonstick pan to sear salmon – if using a cast iron skillet, be sure it is very clean, well seasoned, and very hot. 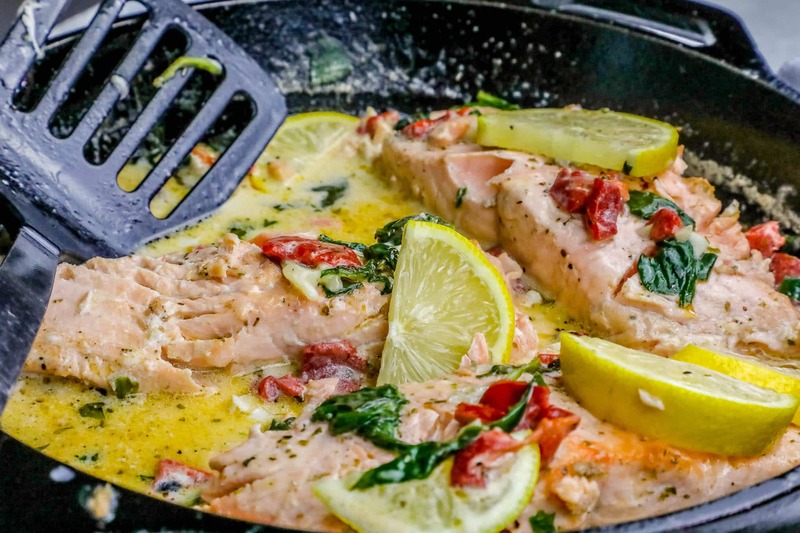 Salmon hitting the pan when it is cold, and then waiting for the pan to heat up, will NEVER release easily! 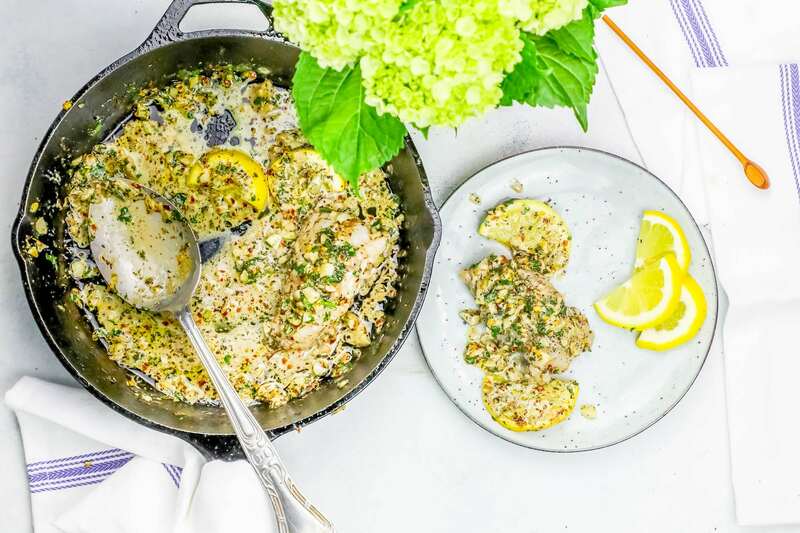 -Serve over a bed of wild rice for a rich, creamy rice that soaks up all of the delicious lemon cream sauce flavor! 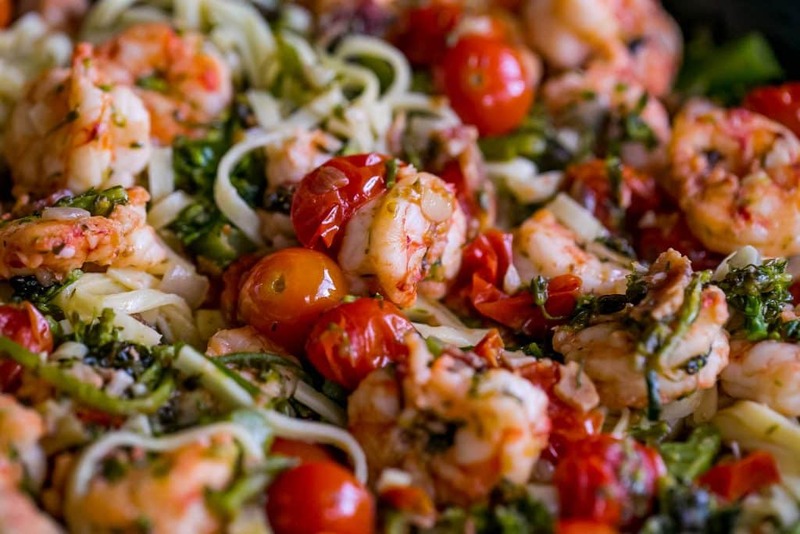 -Serve with fettuccine for a creamy, florentine pasta that is full of vibrant color. 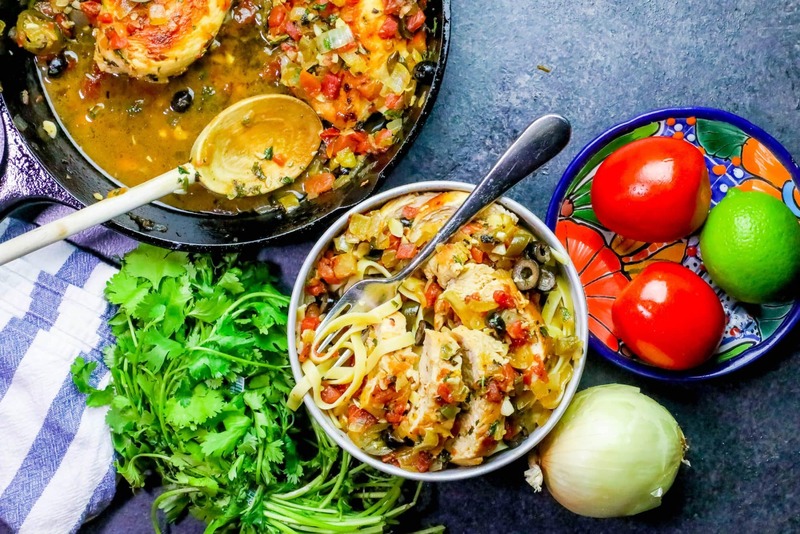 -Ladle over zoodles (zucchini noodles) or other veggie noodles (sweet potato, yellow squash, beet, or carrot would all work well) for a healthy, low carb pasta that will crush your carb cravings. -Serve with cauliflower rice as a creamy power bowl that is full of nutrients and won’t slow you down. -Serve with roasted vegetables (asparagus and broccoli are amazing with this sauce), and dip them in the extra sauce. 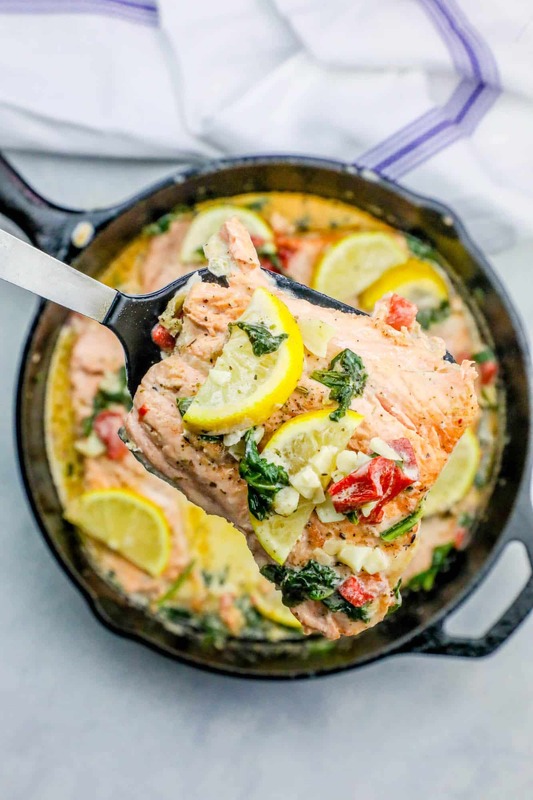 If you love this delicious creamy salmon with spinach, you’re going to love my other simple, easy dinners that only use one pot! And be sure to follow along with my pinterest board full of the best one pot recipes from the best bloggers around! 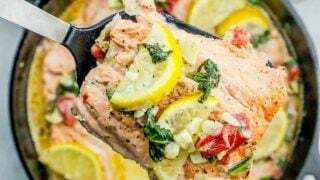 I hope you love this deliciously easy creamy lemon salmon and spinach recipe as much as my family does! 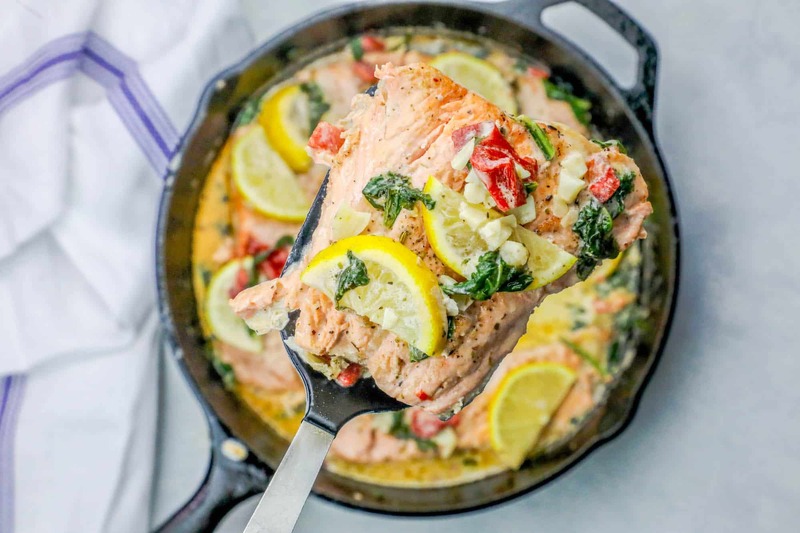 One Pot Creamy Lemon Salmon Florentine Author: Courtney O'Dell One Pot Creamy Lemon Salmon Florentine Skillet is a simple, delicious meal your whole family will love! In a large nonstick pan, heat butter. Let skin brown, about 3-4 minutes. Flip and let salmon skin crisp, another 3-4 minutes. 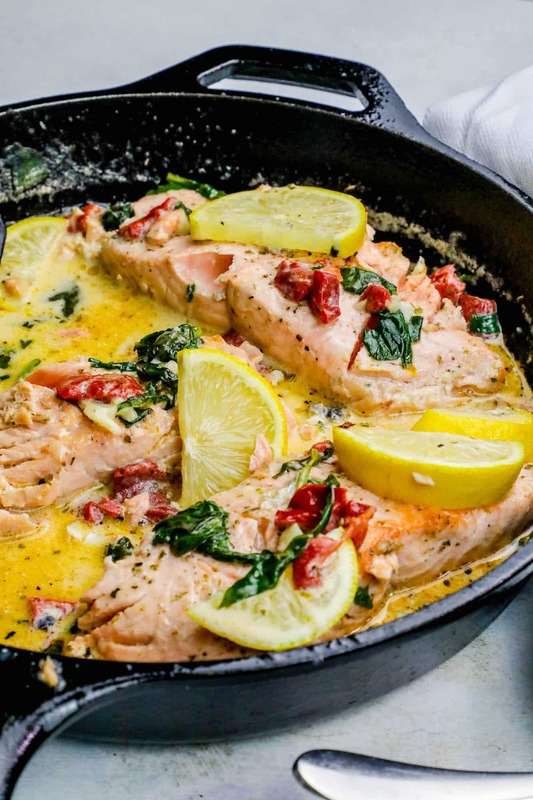 When salmon has browned on each side, remove from pan. Add garlic to pan, let brown and soften. Add roasted red peppers and italian spices. Add in stock or wine, and lemon juice, and let come to a boil, stirring often. Turn heat off, and slowly add in cream, whisking vigorously to combine. 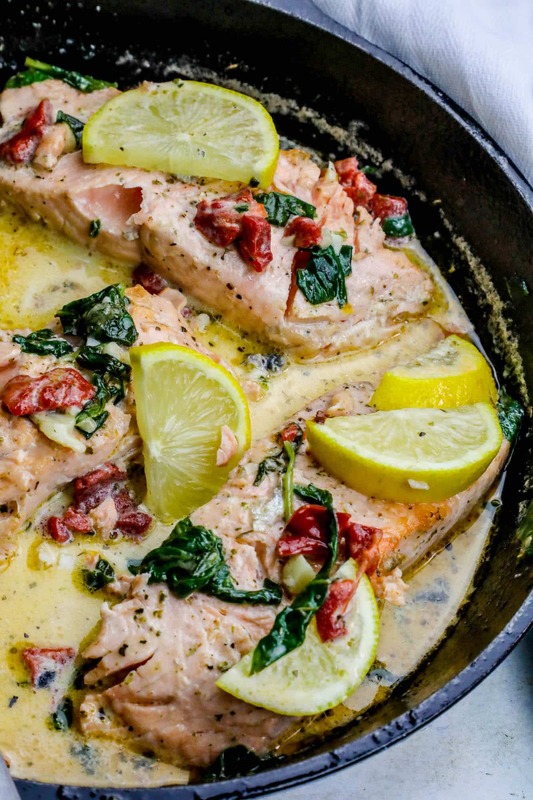 Slowly return heat to medium high and add salmon back to pan, top with spinach and lemon wedges. 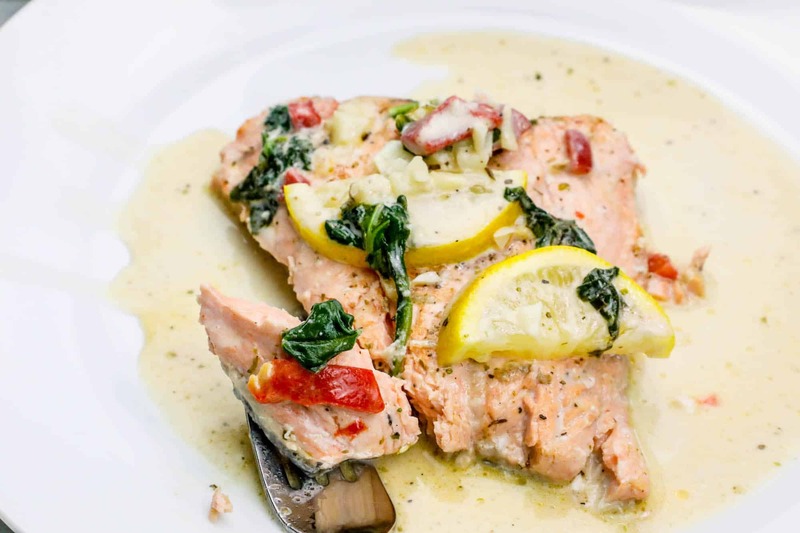 Let spinach wilt, and salmon fully cook, ladling sauce over fish to help them cook. When sauce is thickened and salmon is cooked through, remove from heat and serve - with vegetables, over pasta, or with rice! hi, what kind of stock do i use instead of the wine? Fatima – you can honestly use any kind of stock you love, but I’d suggest vegetable or fish stock. 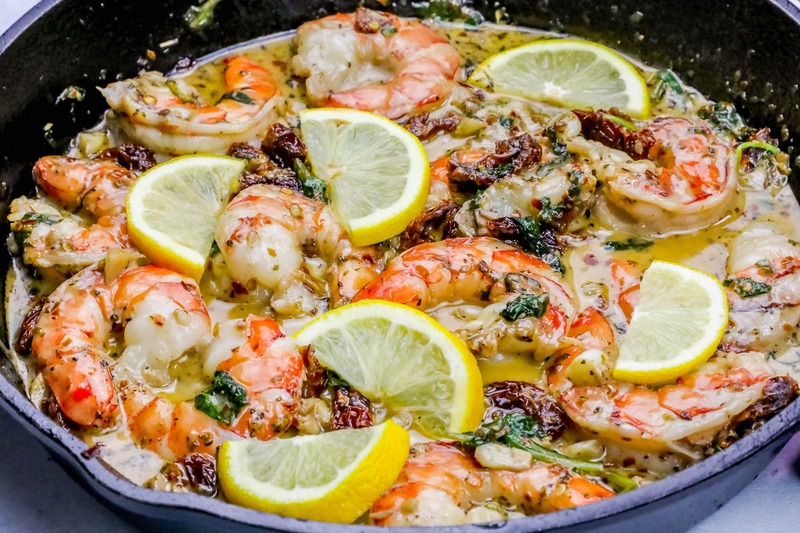 I would like to make this tonight,but recipe seems rather vague,like when to add wine and lemon juice.Hope you can help? 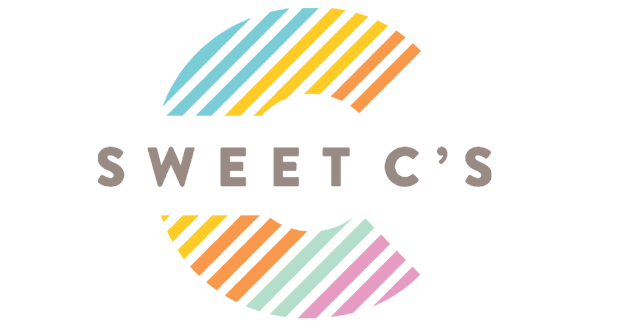 I’m not sure if it was a glitch in my recipe plugin – but it’s there when I looked, right before them cream. Hope that helps!